Francesca Battistelli is back with this year’s album, 'If We're Honest'. Francesca is quickly becoming one of Christian music’s most popular icons, but is she really that good? 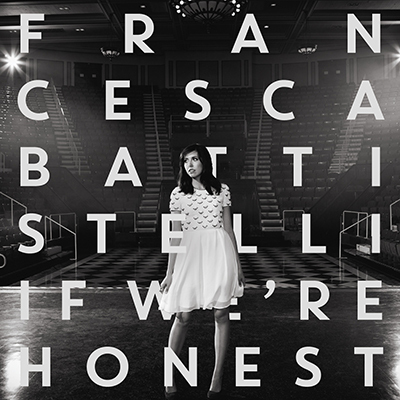 Read More Francesca Battistelli is back with this year’s album, 'If We're Honest'. Francesca is quickly becoming one of Christian music’s most popular icons, but is she really that good? The answer is YES! The album kicks off with, 'Write Your Story', in which she is telling God to write his story on her heart. This should be all of our prayers. God needs to be in control and guide and lead us in life according to his plan and purpose and that is what this song portrays. His plan is always the best plan. In the bridge she says these words, "I want my history to be your legacy," that’s what it is all about. Moving onto 'When the Crazy Kicks In', she starts to sing about the start of her day and how she wants to spend it with God. Before the kids wake up and before all the distractions start she wants to spend a little time with God to help her get through the day. In the next song, 'He Knows My Name', Francesca states the fact that before God came into her life she was nothing, which is true for all of us. She talks about how he could have chosen anyone but he chose to choose her. In the chorus she sings these powerful lyrics, "I don't need my name in lights, I’m famous in my father’s eyes, make no mistake, He knows my name." All I have to say to that is, Amen. 'Unusual', takes a slightly different theme. She sings about someone who, to the world, is a little weird. Someone who gets bullied because she is different, which is something a lot of us can relate to. Then she sings about how she is beautiful because she is being the person that God made her to be. This is an encouragement to all of us. God thinks we are all beautiful and he has made us all 'unusual', but that’s a good thing. Next is 'Choose To Love', in this song she talks about how she is going to push herself out of her comfort zone for God’s Kingdom. The way she says she is going to do this is to reach out to people and do the very thing that Jesus did and that is Love. 'Run to Jesus,' like 'Unusual', is a song that will talk to a lot of people. In this song she talks about how when things get tough and you’re unsure of what to do, and you want to give up, the thing that will help you most is running to Jesus because he is the only person that will always be there when you need him. "I close my eyes and I can see, the arms of mercy holding me, I close my eyes and I can see the arms of Jesus holding me." This is what the next track, 'Find Rest', is all about. Putting your hope in God and feeling safe and secure in his arms no matter what the situation is, understanding that he always has a plan. 'If we’re Honest,' talks about how it is easier to keep the truth hidden then to let it out. It sends out a message that we are all broken but if we bring it to Jesus his love can heal it. And when you make that decision it will change our lives and set us free from that thing that has been holding us back. The next song on the album is, 'Giants Fall', which encourages us that no situation is too big for God. God is bigger than anything we could ever face. She tells you to step into the fight because God is right by our side and he will help us to overcome those 'Giants' in our lives. Matt Hammitt joins Francesca for our next track, 'Hands of God'. You can interpret this song the way you want to but in my opinion she is singing about her husband and how God brought him along her path to help her in life. And even though God is with her, God gave her him as an extra helping hand. And God does bring people along our paths to help us. Next up is, 'We Are the Kingdom', in which she sings about how we were made to be the Kingdom of heaven. Shining like beacons for his Glory. He has set a fire inside of us that we can’t hide and we are the citizens of heaven. 'Holy Spirit', is one of those songs a lot of us would have heard before through Jesus Culture. So she didn’t need to convince me that the song was good because I already knew that. What she had to do was make me like her version more than any of the others. When she hit’s the bridge of this song she succeeds. Holy Spirit you ARE welcome here. 'Keeping Score', reminds us that it doesn’t matter what we have done, Jesus has paid the ultimate price on the cross and he isn’t keeping score because the things we have done aren’t as big as his love for us. Finally featuring, All Sons and Daughters, is 'Tonight'. "Your love is deep and your arms are wide, I will rest in your arms tonight." Following the theme of the majority of the songs on this album, 'Tonight' is a beautiful finish to a great album. So with its pop feel and occasional country twist and lyrics that speaks to every heart. I have fallen in love with this album and will be listening to it over and over again. To finish the album off she has included, 'Giants Fall', and 'Write Your Story', live at Marathon. This album is absolutely worth buying!